For the Bollywood film, see Badlapur (film). 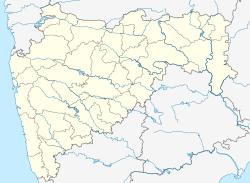 Badlapur is a city in Thane district, Maharashtra state, India. It is a part of the Mumbai Metropolitan Region. The Matheran Range starts at Haji Malang in the north-north-west, continues to Tavli in the north, and then runs south and finally terminates at Bhivpuri Road Hill. Strictly speaking, this range is not a part of the Sahyadris, but rather runs parallel to the Badlapur-Karjat railway line to its west. The Sahyadris proper run parallel to the same railway line, but to its east. ^ Kapadia, Harish (2004). Trek the Sahyadis. pp. 51–56. ISBN 978-8-173-87151-1. Retrieved 27 October 2015. Wikivoyage has a travel guide for Badlapur. This page was last edited on 13 March 2019, at 09:50 (UTC).